The global flocculants and coagulants market was valued at $4.8 billion in 2017. The flocculants and coagulants market is further anticipated to witness growth of 5.3% during the forecast period in terms of value. The growth of this market is attributed towards its extensive utilization towards every process of water treatment as it helps in diminishing the operating costs along with eradicating the particulate compositions present in contaminated water. Flocculation and coagulation aims at removing substances from the water with a help of a chemical cleaning action and is generally undertaken at the time of sedimentation process. Moreover, it has been observed that increasing preference towards organic coagulants as compared to that over traditional coagulant that includes polyacrylamides and alum is further driving the growth of global flocculants and coagulants market. Moreover, increasing industrialization has further stimulated the need for treating water resources that is ultimately bolstering the growth of global flocculants and coagulants market. On the basis of type, the global flocculants and coagulants market is segmented into flocculants and coagulants. Flocculants are further sub categorized as anionic, cationic, non-ionic, and amphoteric. Coagulants are further sub categorized into organic and inorganic. Organic are further sub categorized as polyamine and polyDADMAC. Inorganic are further sub categorized as aluminum sulphate, polyaluminum chloride, ferric chloride, and others. Among all these segments, flocculants is projected to hold larger revenue in the global flocculants and coagulants market. This segment is observing rampant growth owing to its widespread application in several industries. On the basis of application, the global flocculants and coagulants market is segmented into pulp & paper, oil & gas, water and waste water treatment, mining, textile and others. Among all these segments, the water and waste water treatment application is anticipated to witness fastest growth of 5.7% during the forecast period in terms of value. Increasing demand for chemicals in the process of municipal water treatment and stringent regulatory reforms that are on the utilization of water resources and environment for the well-being of public are the major factors driving the growth of global flocculants and coagulants market. The growth of flocculants and coagulants market is highest in Asia-Pacific due to increasing population and increasing rate of industrialization that has enforced the governmental authorities of this region to execute stringent government reforms on the water treatment processes that is further exaggerating the growth of global flocculants and coagulants market. Accelerating demand for alternative water treatment practices such as UV disinfection and RO filtration are expected to hamper the growth of global flocculants and coagulants market. Globally industry players of global flocculants and coagulants market are leveraging market growth through technological advancements, product extensions and development of competitive edge that develops competitive strength among the industry players on factors that includes operational cost, innovation, product quality and price. Geographically, North America has been dominating flocculants and coagulants market in terms of revenue. Infrastructural development along with implementation of stringent government reforms are the major factors driving the growth of flocculants and coagulants market in this region. Furthermore, it has been observed that the encounter of shale gas in North America has bolstered the demand for flocculants and coagulants in oil & gas industry of this region. Moreover, Asia-Pacific is expected to witness fastest growth of 7.7% during the forecast period in terms of value due to rapid industrialization, demand for flocculants and coagulants from municipal sectors increasing demand for renewed water reservoirs. Additionally, the pulp & paper industry in this region occupies dominant position specifically in Indonesia and China that is ultimately impacting the growth of flocculants and coagulants market in this region. 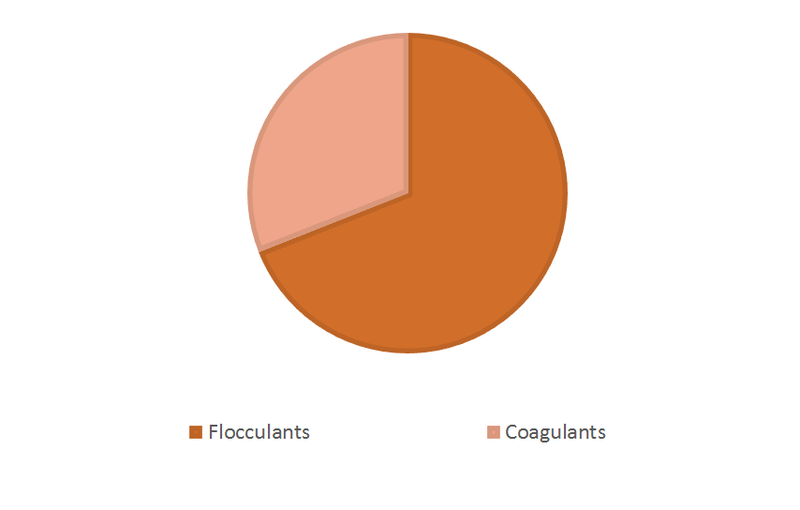 Some of the key players in the global flocculants and coagulants market include SNF Floerger, Kemira OYJ, Ecolab Inc., BASF SE, Solenis LLC, Feralco AB, Buckman Laboratories, Inc., Ixom Operations Pty Ltd, Kurita Water Industries Ltd., Suez S.A., Aries Chemical, Inc., and Chemifloc Limited. 11.9. Kurita Water Industries Ltd.
Table 78 Snapshot – Ecolab Inc.
Table 82 Snapshot – Buckman Laboratories, Inc.
Table 84 Snapshot – Kurita Water Industries Ltd.
Table 85 Snapshot –Suez S.A.
Table 86 Snapshot –Aries Chemical, Inc.